This tier list will show you how good your Fire Element 5 star characters are when it comes to burst damages and ranking events. Refer here if you are looking for specific or elemental characters that you can use for your team. - SS3s are easy to spam (turn off Auto-Approach to increase range), watch out for mid-air targets to avoid misses. 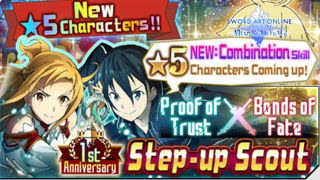 - Combo Partner: [Asuna] - Increases damage by 10%. - SS3s are easy to spam just time it well, best with combinations. - Combo Partner: [Sword] - Increases damage by 10%. - Combo Partner: [Leafa] - Increases damage by 10%. - Combo Partner: [Lisbeth] - Increases damage by 10%. - Combo Partner: [Lance] - Increases damage by 10%. - Combo Partner: [Rain] - Increases damage by 10%.